Belgorodskaya Oblast is situated in the southwest part of the Central Russian upland (its height is 276 m). Distance of the region from north to south is 182 km, from east to west - 266 km. It borders upon Voronezhskaya Oblast in the north and northeast, Kurskaya Oblast in the north, Ukraine in the south and west. The climate here is moderate continental. The average temperature of January is +8 degrees centigrade, of July - +20 degrees. Precipitations are about 500 mm annually. The biggest rivers are the Seversky Donets, Oskol, Vorskla, Korocha. More than 600 thousand hectares are rich in chernozem. Belgorodskaya Oblast was founded on January 6, 1954 by the Decree of the Presidium of the Supreme Council of the USSR. Belgorod became the regional centre. Since 1727 till 1779 there existed the Belgorod province. But later (since 1779 till 1954) the biggest part of the territory of modern Belgorodskaya Oblast was included into the Kursk province. 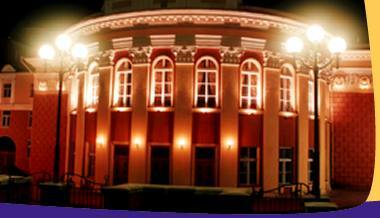 Lately the history of Belgorod 'was prolonged" for centuries. Earlier the generally accepted date of foundation was the year of 1593, later it became 1237. But according to newest archeological research Belgorod ought to have celebrated its thousand-year anniversary in 1995. The founder of Belgorod was prince Vladimir. In the end of the 16th century Belgorod served as a defensive fortress that protected the southern boundaries of the Russian state against attacks of the Crimean Tatars. In the 17th century it became the main military and administrative point at the southern border. In 1785 due to joining of Crimea to Russia Belgorod ceased to be the fortress. Since 1708 it was a part of the Kiev province, since 1719 - of the Kursk one. Since 1727 till 1779 Belgorod became the centre of the Belgorod province. Gradually it turned into a large industrial centre. In 1779 it became a part of the Kursk province again. In the year of 1869 there appeared the Kursk-Kharkov railway line. In 1934 Belgorod became the centre of Belgorodsky district of Kurskaya Oblast. During the Great Patriotic War Belgorod suffered fierce fights against fascists (during the Kursk battle of 1943). In honour of liberation of Belgorod and Orel in Moscow the first salute in the history of the War was held. Since then Belgorod was named "the city of the first salute". In January 6, 1954 Belgorod became the centre of Belgorodskaya Oblast. Its area is 27,1 thousand sq. km. The oblast is divided into 21 districts, 9 cities, 2 urban districts, 21 urban villages, 331 villages. The centre of region is Belgorod. Distance to Moscow is 695 km. The population totals 293 (1987), 314 (1994) thousand people. Clubs, Houses of culture, libraries, cinemas, theatres, museums, showrooms of Belgorodskaya Oblast present true cultural values to spectator. The Belgorod State Universal Scientific Library has the status of the central library of the region being the largest one (its stock totals more than 2 million books). State museums are situated in places of battle glory, in sites of archeological excavations, in settlements connected with names of well-known people. In Belgorod they are the Local Lore and Art Museums, the Museum "The Kursk Battle". To commemorate the 50th anniversary of the Victory in the Great Patriotic War in Prokhorovka was established the State Hictorical and Cultural Reserve "Prokhorovskoye Pole".